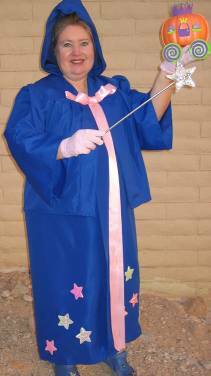 For princess parties, your child uses a magic wand to help her Fairy Godmother turn a pumpkin into a glittery coach. The birthday girl is crowned with a magical tiara and receives a regal cape! Party includes princess-themed party games, guests making their own magic wands, crowning ceremony, tiaras for each little girl at the party (crowns or shields for the boys), princess certificate for each child, face painting, balloon flowers and bumble bees for girls, balloon swords for boys. The fairy godmother tells the tale of Cinderella and involves guests in the story! A huge mouse puppet joins the guests while you serve cake!